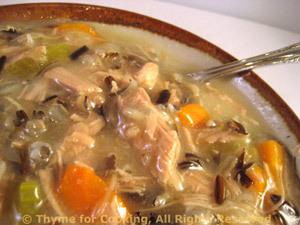 Easy Dinner from Thyme for Cooking: Turkey Wild Rice Soup. Wild Rice soup was a favorite at the local deli bar where I lived in the US. And they were famous for it. It was delicious, and so thick with cream you could stand a spoon in it. This isn't, but it is delicious. Stock can be made 2 - 3 days in advance. The key to a rich stock is to let it simmer over very low heat for a very long time to let all of the goodness eke out of the bones. It's what gives a good stock a luscious 'mouth-feel'. Use a turkey carcass from a roasted bird or buy wings, necks, and/or legs for the stock. I used a leg and a thigh - and had more meat than I wanted for the soup - turkey salad sandwiches. 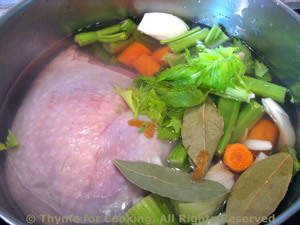 Put turkey, vegetables, herbs and water in soup pot or Dutch oven. If you are using a turkey carcass you may need to break it up to get it in and covered with water - and you may need more water than 8 cups. You can reduce it later. Cover, bring to a boil, reduce heat and simmer over very low heat for several hours, the longer the better. There should be bubbles breaking the surface occasionally, not steadily. When done, strain stock into another pot or large bowl, discarding vegetables, bones and skin. Pick the turkey meat off the bones and reserve for soup. If time allows, chill stock and remove fat. Refrigerate turkey if not making soup immediately. Lightly rinse the wild rice and add to stock. Cover, reduce heat and simmer for 45 minutes. Taste the soup, add salt, pepper, or a chicken stock cube/paste if needed. Cut the turkey into small pieces and add to soup. Dissolve cornstarch in sherry and a bit of milk. Increase heat under soup to a hard simmer. Stir in cornstarch mixture, stirring until it clears and thickens the soup slightly. Stir in the milk, heat through and serve. Note: The cornstarch is meant to thicken it very slightly, you may not really notice it when it's hot, but it makes it more unctuous. This is very simple, easy and yet, properly impressive. I sauté the apples lightly in butter to coat them and prevent browning as well as to start the cooking process so they soften sufficiently in the oven.... And because it adds a lovely flavor. Cut 2 squares, rectangles or circles out of the puff pastry... whatever works best, shape is not important. Cut apple in quarters, through core. Slice out core, then thinly slice each quarter. Heat butter in medium skillet, add apple slices and sauté over medium heat for 3 - 4 minutes, just until warmed through. 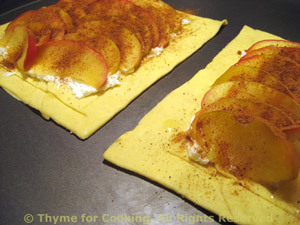 Lay puff pastry on baking sheet, either nonstick or lightly oiled. Divide the ricotta spread within the scored lines. Arrange the apple slices on the ricotta. 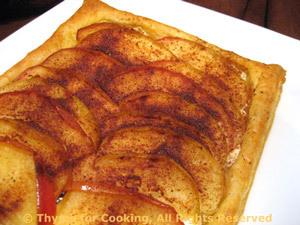 Bake in a pre-heated oven at 420F (210C) for 10 - 12 minutes, until sides of pastry have puffed around middle and are golden brown.